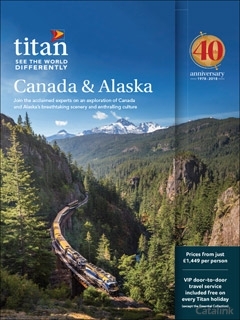 To order a printed copy of the Titan - Canada & Alaska brochure, simply click the Request button below. If your perfect holiday comprises awe-inspiring scenic beauty and unforgettable rail journeys, elegant cities and enthralling colonial heritage, there can be no better destination choice than Canada. This brochure also features the breathtaking natural splendour of Alaska, which may be appreciated by land or sea. Follow in the footsteps of pioneers and gold rush speculators, discover a rich cultural history with Native American and Russian influences, and sail through vast alleys of blue-streaked icebergs looking out for breaching humpback and orca whales. View or request the Titan Travel Canada Brochure now for breathtaking journeys to Canada. By pressing the Request Printed Brochure button you give consent to Titan - Canada & Alaska (and their Data Processors for the specific purpose of delivering your literature) to send you their Brochure .